Let's see if we can start a new unbeaten run and have our morale high before facing Napoli at home. "You can live to be a hundred if you give up all the things that make you want to live to be a hundred." Yup, a fun week coming up and a proper beating of Nürnberg would give it the perfect start. Bundesliga Preview: Nürnberg to Inflict More Misery on Bayern? i wasn't expecting hanoover to kick our us either but they did it actually !! . A derby is usually a hard task to go through !! i expect a hard win though. I think that we are playing fantastic football at home this season. We are probably going to get an easy win but we need to improve a lot in away games. We are not being that brilliant when we play away from home, just look at our games in Wolfsburg, Hannover or Hoffenheim. I am pretty sure Alaba will see some time tomorrow and I hope it is not as a defender. Ribéry will need to be rested for next Wednesday against the Italians. Seems like Boateng's the only one getting some rest. I really hope Gustavo won't start, he's the CB backup and needs to play the Napoli game on Wednesday. Save the Earth. It´s the only planet with beer. 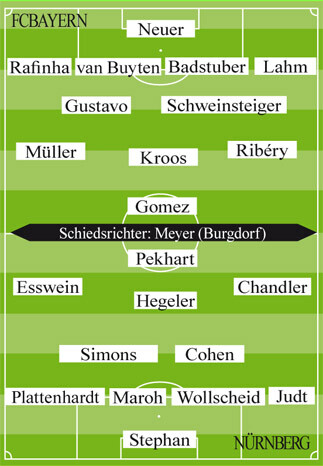 Neuer; Rafinha, van Buyten, Badstuber, Lahm; Tymoshchuk, Schweinsteiger; Müller, Kroos, Ribéry; Gomez. Stephan; Chandler, Wollscheid, Klose, Plattenhardt; Judt, Simons, Cohen; Kamavuaka, Esswein; Pekhart. Pretty happy with that lineup, I guess. I predict a 5:0 , today we will see the profit for rotating the team in the pokal.